Will Boeing 787 ever break-even? Boeing 787, the Dreamliner, made its first commercial flight with Japanese airline All Nippon Airways between Tokyo and Hong Kong. The event has been widely covered in general and specialized press. One of such articles, in Bloomberg, was the spark of a conversation with a colleague that led to the following question: will the 787 ever bring value to Boeing? Will the net present values of all the cash flows related to the programme ever be positive? After a conversation, I decided to try to answer to those questions, using information found in different sources across the internet. Lately there has been much discussion in the media about what would be the Boeing’s “accounting block” size (finally it was announced to be 1,100 aircraft units). This concept refers to the number of aircraft upon which Boeing is going to spread the amortization of the work in process now in the balance sheet (around 18bn$ at 2011 Q3, according to Boeing), excluding R&D costs (which were already accounted for in previous years’ income statements). While the concept has raised much attention, it is irrelevant to appraise the 787 as a long-term investment project, for which yearly cash flows, accordingly discounted for (to take into account the time value of money), shall be calculated. This time including R&D costs. Together with the previous concept, last days’ news have often discussed the concept of “learning curve”. This is a concept typically used in aerospace industry and which will be central to the discussion of whether the 787 will be or not a success as an investment project. The press has stated that Boeing’s targeted learning curve for this programme will be 75%, despite of having less control over the supply chain in comparison with previous developments. That means that every time production units have doubled, the unit cost will have decreased in 25% (if unit 100th costs 100, unit 200th shall cost 75). In the last new aircraft development, the 777, Boeing reportedly experienced a curve of 84% (costs decreasing 16% every time production units doubled). In this exercise I will make use of different values for the learning curve in order to see its influence (90%, 84% -as with 777-, 80% and 75% – Boeing’s target). This basic concept of finance theory is rarely covered by the press. The then-assistant professor of Economics and Public Affairs at Princeton University, U.E. Reinhardt, in his paper “Break-even analysis for Lockheed’s TriStar: an application of financial theory” (PDF, 2001), analyzed comprehensively the project of the TriStar making use of information that became public at a moment when Lockheed officials took part in Congressional hearings over a loan-guarantee needed by the TriStar programme (1971). Reinhardt found that the figures that appeared in the media led one to consider that the programme cash flows were not discounted either to the time at the beginning of the project or to the time of the congressional hearings, as prices and market numbers would had only produced a positive net present value if the discount rate had been in fact around 0%, that is “only if one assumes that the company was prepared to advance the enormous sums required for that project without asking for any positive return on this investment”. Typically the discount rate used to evaluate different projects is the cost of capital of the company. For this exercise I have used different rates to see its influence in the results (0%, 5%, 10% and 12%, being the last two typical figures used in industry). As a side note: Reinhard used as learning coefficient 77.4%, close to the optimistic 75% targeted by Boeing and lower than the disclosed 84% of the 777 case. In order to build the exercise, different sets of data need to be collected. I will discuss them below, indicating the sources used and explaining the assumptions taken. According to news reports, this year Boeing will deliver between 15 – 20 787 and 747-8, being about two-thirds of the latter. From that information I took that about 6 787s will be delivered in 2011. From then on, the ramp I used tries to replicate what the media is reporting. Boeing intends to reach a rate of 10 aircraft per month by end 2013, thus from 2014 I assumed Boeing will produce 120 787s every year (as Boeing factors down time into calculation of the monthly rate). According to Seattle Times, this week Boeing is increasing its rate from 2 aircraft per month to 2.5. Since between 2012 and 2013 this rate has to increase from 2.5 to 10, I assumed an average of 3 aircraft/month for 2012 and 6 for 2013. Boeing publishes in its website the number of aircraft ordered each year. For this exercise, I took into account the net orders in the year of order. In the last conference call, Boeing stated that it sees an addressable market for the 787 in the next 20 years of 5,000 aircraft (this number of aircraft reflects deliveries). As of today, Boeing has close to 800 orders. This backlog covers the production until somewhere in 2019, in order to keep the production line with a steady production rate, I assumed Boeing will sell the necessary aircraft to allow a steady state production of 120 aircraft per year until the end of the exercise in 2034. That would mean Boeing would have delivered 2,634 aircraft, a bit over half of the 5,000 aircraft that represents the addressable market. Since Boeing has already sold close to 800 of those 2,634 aircraft, I assumed the rest will be sold evenly every year, or at a rate of 82 aircraft per year from 2012. Boeing publishes in its website the list prices of all its models. The list price of the 787 today ranges from 193.5 to 227.8 million USD, or about 211 M$ on average. At the end of 2010, Boeing raised its list prices 5.2% on average. The previous raise had taken place in 2008, 2.6% in relation to 2007 prices, when they had been raised another 5.6% after two years. From those numbers, I made the assumption forward and backward that on average Boeing raises its list prices about 2.6% per year. I have already published two different posts about average Boeing price discounts for 2009 and 2010. A recent article from Flight Global confirmed the order of magnitude for the case of the A380. The discount rate I used for the exercise is 38%. Another confirmation of the order of the discounts specifically for the 787 comes from the following analysis by Jon Ostrower, from Flight Global, who reports prices of 787 to be around 76M$ in 2004-2006, excluding engines, which were about 20-30M$ (a total of 96-106M$). Taking the list prices above for those years and using the 38% discount for that period of 2004-2006 the real prices given by my model are in the order of 101-104M$, in the same order that Jon’s information. Here I used for the exercise the same assumption I had used to calculate Boeing discounts in previous posts: a single 3% down payment taken from the AIAA paper “A Hierarchical Aircraft Life Cycle Cost Analysis Model” by William J. Marx et al.). Regarding down payments, I once received another input in my blog from the analyst Scott Hamilton (Leeham), where he mentioned several progress payments of 3-5% of the price of the aircraft so that at the time of delivery 30% of the aircraft had already been paid for. Simulating these payments complicates the model, but, since early cash inflows may have an impact in the break even analysis, I have checked the variation with different sizes of down payment (3%, 20%). These are the main inputs needed for the whole analysis. Most of the non-recurring cost (NRC) have already been incurred, thus, there is little room for manoeuvre in there. 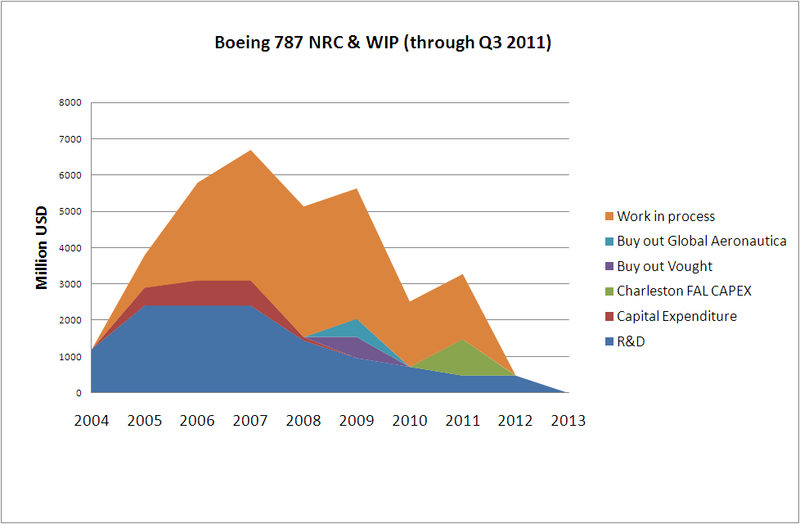 However, regarding the recurring costs (RC), those are where Boeing has the chance to make the programme profitable. Seattle Times provided a detailed description of the incurred costs that Boeing had through end September 2011. The account was split in different categories of non-recurring costs (R&D, CAPEX, buying out partners) totalling over 16bn$. In the same article there was another explanation about the recurring costs (inventory –work in process, supplier advances and others) incurred so far: up to 16.3bn$ by September. This last figure has risen to 18bn$ according to the last conference call given by Boeing. In order to build the cash flow profile, it is necessary to know the cash flow profile of the costs described above. Since we have only information regarding some of those (buyout of partners, CAPEX for Charleston FAL) I needed to make an assumption for the rest. In this case, I used the same cash profile used by B. Esty and P. Ghemawat (both then at Harvard Business School) in their paper “Airbus vs. Boeing in Super Jumbos: A case of failed Preemption” [PDF], where they performed a valuation analysis for then known as A3XX (now A380). Boeing 787 costs through 2011 profile. Regarding the recurring costs, the main finding to be done is the recurring cost of the aircraft at a certain point. Once we have a reference, we can play with the learning curve to see how the costs will be in the future or were in the past. Different sources quote figures as 250-300M$ or even 400M$, but they do not explain whether that is the cost of a unit right now (e.g. serial number 44) or whether it is the average cost up to now (they do not indicate how many aircraft are included in that average either if that was the case). The approach I followed was different. Boeing has disclosed it has 18bn$ as WIP related to the 787, and from local press we know what is the state of production right now, thus, we can try to estimate what is the average cost of the aircraft already produced. The aircraft delivered to ANA needs to be discarded as its portion of WIP has already been included in the income statement of Q3. We know that at Seattle FAL there are now serial numbers 46 (to be completed according to press) to 50 (just arrived, according to Jon Ostrower). Thus, within WIP there must be about 44 aircraft almost completed and another 5 about 98% completed (FAL value added is around 4% of RC). That means that at least about another 20 aircraft are being manufactured when other aircraft are at FAL. We can assume an average stage of completion of 50% of costs incurred in each one. With these assumptions, we gather that the 18bn$ correspond to about 58 aircraft in different stages of work in process (WIP). This gives us an average cost of about 310M$ apiece, close to the figures mentioned by some sources. The difference is that now we have a reference of cost and aircraft unit or units for that cost (1 delivered + 44 finished + 5 at FAL + 10-20 WIP ~ 60-70 aircraft). With this average cost and using the learning curve formulas, we can deduct the unit cost of the first unit produced, which will be different for each learning curve we select, and from which all the costs of future units will be calculated. With all the data gathered above, and the required assumptions made, we can build a comprehensive valuation analysis. The first graphic that is shown is what I believe will be the real scenario for the 787: it will not break even in the first 30 years of the programme, discounting cash flows. It won’t break even before 2034. In this case, I used the learning curve of 84%, that which was reported as the real one for the 777, and which is more conservative than the targeted one, 75%. As discount rate for the cash flows I used 10%, which could be even considered a bit low. 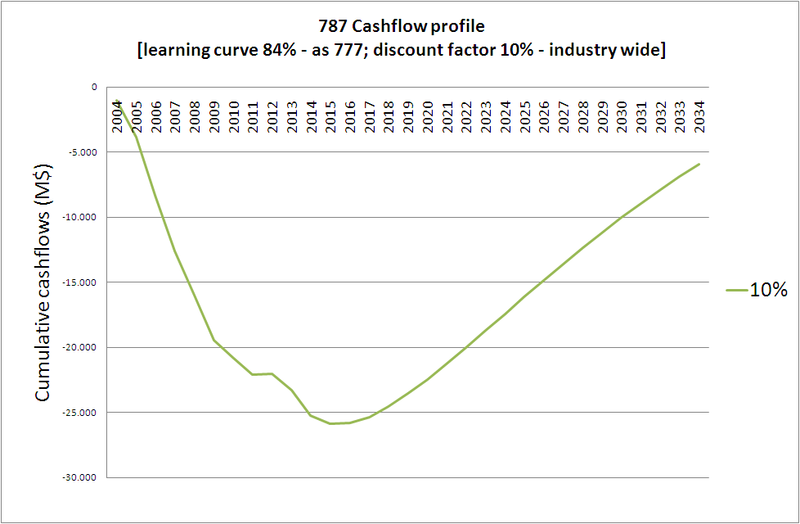 787 cash profile for a learning curve of 84 and discount rate of 10%. When will then the 787 break even? I continued the series for this set of reference parameters (84% curve and 10% discount rate) and break even would indeed happen, but not before 3650 units of the 787 have been delivered at the year ~2046. By then production rate would have had to slow down to about 6-7 aircraft per month as the backlog would have been already consumed, thus a new cost structure per unit produced could even make the mentioned date to be deferred even later. The discount factor could be assimilated with the cost of capital. The reference I used was 10%, but let see how the previous graphic would look like in the case the factor was lower 5% and a bit higher 12%. 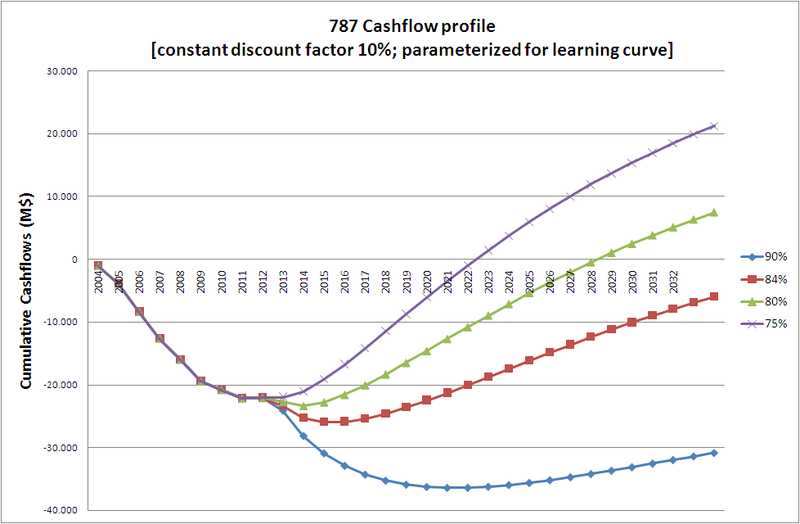 787 cash profile for a learning curve of 84% and discount rate as parameter. We can see that if the cost of capital was as low as 5%, the 787 would reach break even by around 2028, but in the case of 12% it would never break even within 30 years as well. 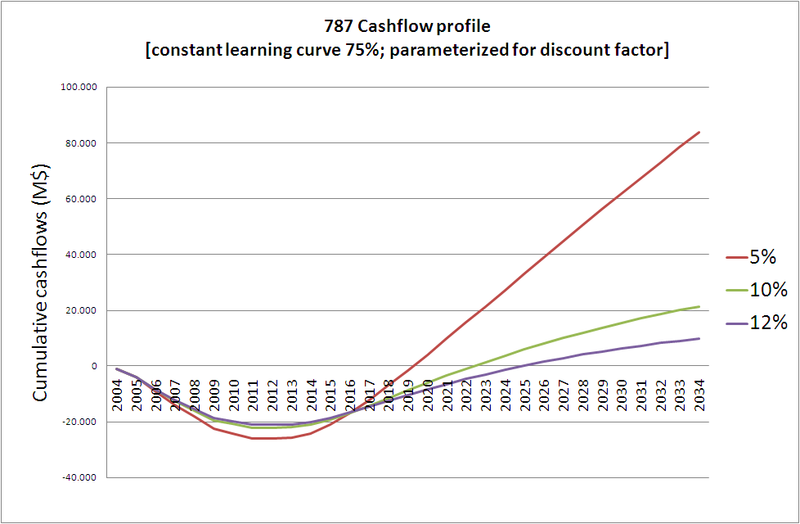 787 cash profile for a discount rate of 10% and learning curve as parameter. I have used a 38% discount over prices. I feel quite confident that Boeing discounts are around that figure, nevertheless, let’s see what would happen to the reference case (84% curve) if discounts were just ~20%, about half of those used, which would make cash inflows much higher at the moment when deliveries start. 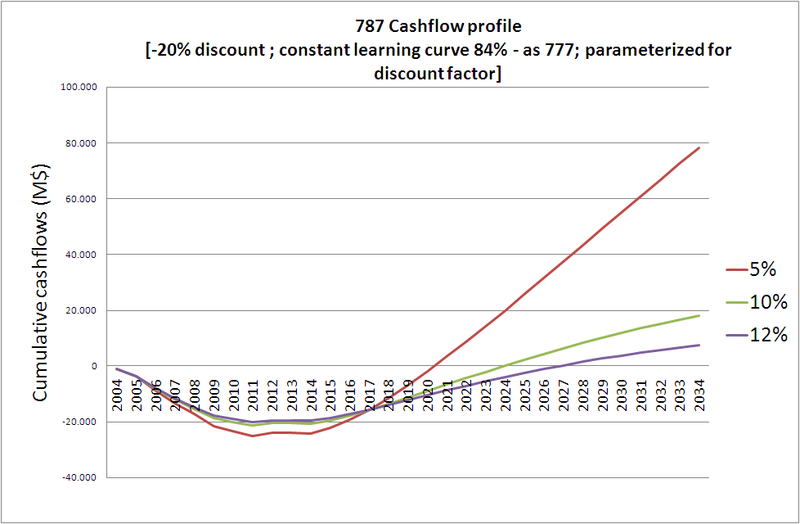 787 cash profile for a learning curve of 84%, discount rate as parameter and discount over price of 20%. We can see that in that case, the break even would be within the first 30 years, at about 2024 already for a DCF discount rate of 10%. Nevertheless, I doubt that pricing power of Boeing will allow it to stop giving ~38% discounts. In the simplified case that the down payment at the time of ordering the aircraft wasn’t in the order of 3% but 20%, this would bring forward cash inflows especially related to the first 800 aircraft ordered and thus improve the business case. However, once the programme is in steady state it wouldn’t change much. You may see that maximum cumulative negative cash flow for the 5% curve only reaches about ~19bn$ vs. ~32bn$ in the reference case. Also for the 5% curve the break even is brought forward 2 years (from 2028 to 2026). 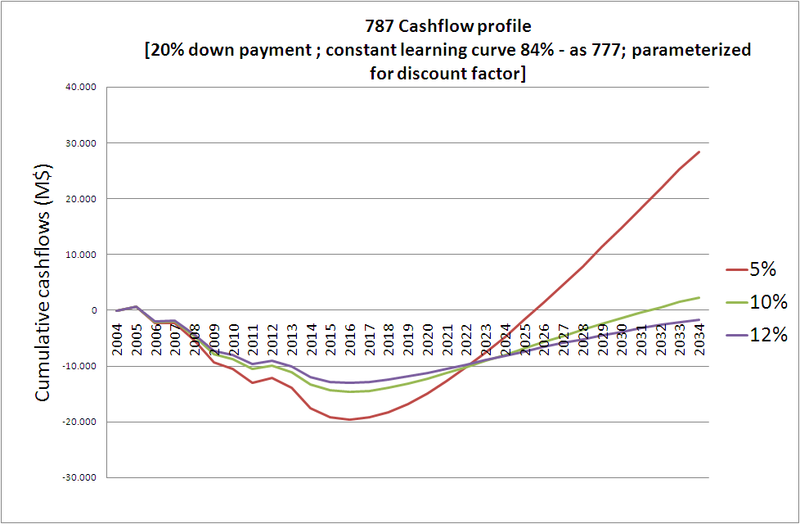 787 cash profile for a learning curve of 84%, discount rate as parameter and down payment of 20%. “Boeing’s view” on the matter? As we have discussed above, Boeing is targeting a learning curve of 75%, ambitious if compared to that of the 777, but not far from that used by Reinhard in his paper. 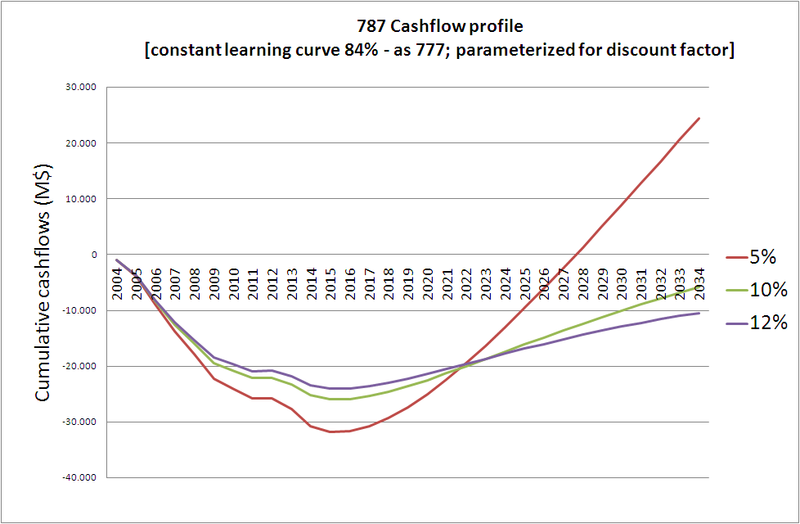 "Boeing's view": 787 cash profile for a learning curve of 75%, discount rate as parameter. In this case, you may see that with a discount rate of 10% break even is reached in 2023. Again, as mentioned above, this is in line with Boeing’s comments in the conference call. Even for a discount rate of 12% break even would come within the next decade at around 2026. This stresses the importance of the learning curve effect and cutting costs during the series production phase. Being in the state that the programme is now, with about -22bn$ cumulative cash flows through 2011, the only way to save it is through experience gained at the production sites. The question then is: Will Boeing be able to achieve that 75% curve? Side note: Let me now come back to the price discounts. I find that the results shown in the last graphic, with the curve Boeing intends to achieve (75%) and a discount rate for cash flows of 10%, as another confirmation of the discount used for prices of aircraft. The model I built takes the 38% figure discounted from list prices, and I find it remarkable that with that figure the model predicts lower unit costs than aircraft discounted prices by 2015 (as mentioned by the CFO, James Bell) and predicts a programme break even at around 2023, about 10 years from now, as mentioned in the conference call. I take the last conference call as an implicit confirmation from Boeing of the discounts it applies to its 787s. What has been the effect of this 3-year delay? This is not easy to estimate, but I’ll give it a try. Most of the assumptions remain constant. I believe that the delay has primarily deferred cash inflows from deliveries, extended R&D related to engineers working in the development for 3 years more sorting out problems and increased WIP of aircraft waiting in the production line. I will also remove cash spent in buying out partners, though this might be arguable as possibly the price of the buyout is cash neutral taking into account partners’ margins disappearing. 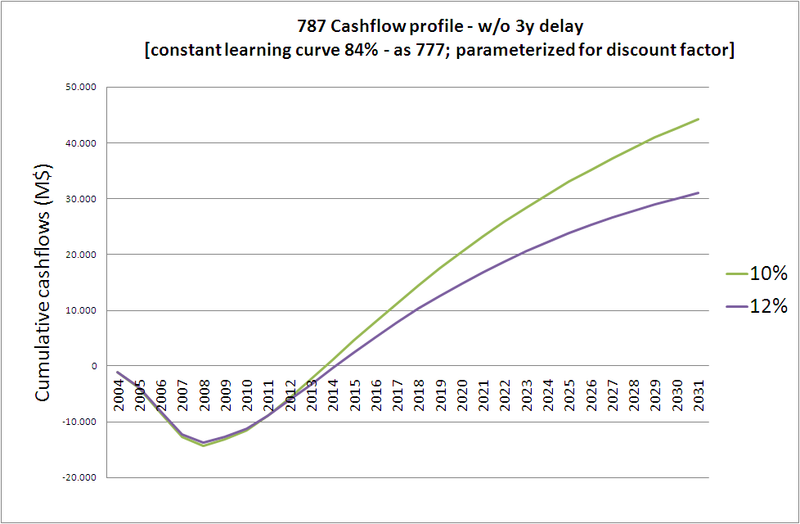 Effect of 3-year delay to 787 cash flows for learning curve of 84%. 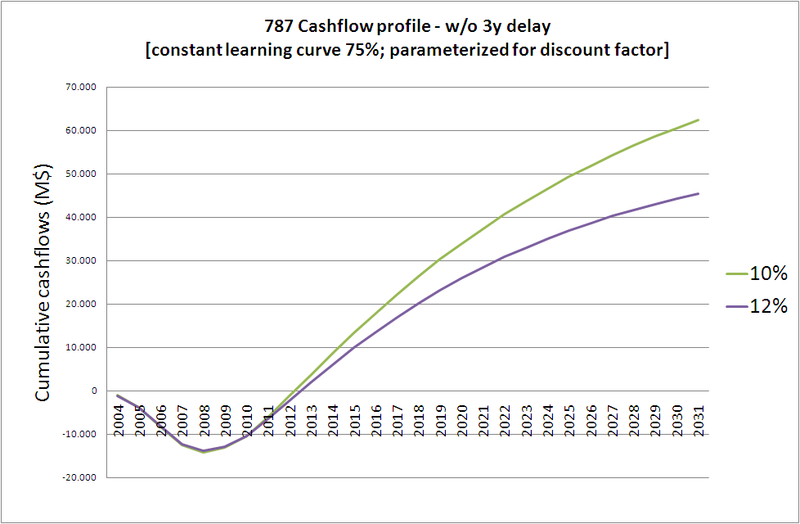 Effect of 3-year delay to 787 cash flows for learning curve of 75%. You may see that even in the conservative scenario (84%) break even is reached in 2014 or 2015 depending on the discount rate. With the more aggressive learning curve, 75%, the prospect is even rosier: from 2013 for both discount rates the programme would have reached break even less than 10 years since its launch in 2004 and 10 years before what now seems to be Boeing’s target break even year, 2023. This result clearly points out how much a delayed programme may hurt the business case of an aircraft development: from being a sound project to converting it into a nightmare that may never break even, jeopardizing future developments in terms of lack of financial and human resources available. What is the “accounting block” size used for then? As its name points out, this is a mere accounting issue. It permits Boeing to spread already incurred costs that have been capitalized (in the balance sheet, not in previous years’ income statements) among aircraft to be delivered in the future. Since Boeing has a backlog of almost 800 aircraft and believes it will sell over 2,500 aircraft, it has prudently opted to spread costs over 1,100 aircraft, allowing itself to start reporting profits on each aircraft delivered almost from day one (from about 2015 in fact), having a shinier income statement and the bonuses that come with it. HMmmm, so I guess one shouldn’t buy Boeing stock until 2034, right and sell it all, if one owns any?! 🙂 Some very interesting numbers but the overall analysis leaves me wondering what it all means. I admit this analysis is over my head, by a wide margin. But I gather that the costs which have already been written off, i.e. paid for in the past, are included in that 2034 calculation. I think the main drivers for a stock’s price is profit, revenue, etc (Bottom Line numbers), which are reported each quarter. So, my simple question is, “is Boeing profit, going forward, being decreased or increased by each 787 delivered? And if it’s negative now, when will it reach zero (leaving out the previously paid for expenses)”? This analysis certainly would not have predicted the run up that just occurred in the Boeing stock price, after the last quarterly report! Projecting what Boeing stock will be doing, going forward, this analysis is not that useful to a Boeing stock owner since quarterly profits and revenue etc are what drives stock prices (note the move up after the good numbers in the last quarter). OOPS, edited/consolidated and then didn’t delete the last paragraph. Sorry for the redundancy. Most of the pain on overweight 787′ s — the 9.8 tons — is on the first 20 or so, after which the weight drops off. I don’t think LN90 will be 6.8 tons overweight, probably around 2 tons or less – tops. I have written a follow-on post to address some of the questions raised here and in other sites plus emails I got. Garry, Tom, some of your questions are addressed there. Good job Javi! hard to understand all this financial stuff! Do you sincerely believe that A-350 would enter flight test next year and deliveries follow in 2013 as scheduled?? Will the A-350 really be the better aircraft in terms of price,range ,avionics and engines ? no delay,no technical problems or so? you are very very optimistic.. Is it possible that some customers could cancel thier A-350 orders and buy 787 instead if A350 is delayed 2-3 years? Stunning post — hopefully you are wrong… One interesting thing with the 777 is that Boeing was able to reach fully the capabilities of that aircraft with the introduction of the longer-range 777’s – particularly the 777-300ER. The 787-9 will have to be the 787 family’s 777-300ER — and that is a very steep curve. Thanks for your comment and your input about the 777-300ER. I had already been told that the 777-300ER “solved” the 777 business case. Something similiar could happen with one later version of the 787. Boeing 777-300ER has driven both Airbus A340-500 and 600 completely out of business and will continue to run roughshot over this market segment until A350-100 arrives which is the only real nose to nose competitor. I found this analysis very interesting and useful. I have some query regarding lurning curve and producer price index consideration. In this analysis I found that you used learning curve but I could not understand from which quantity of A/C it has been applied. Or Can we use learning curve since first A/C (B787) produced? And second thing is PPI (Producer Price Index) is part of cost analysis here, mean PPI is considered here seperately or it is included in lurning curve already!! I will appreciate it a lot. Can you please reply me regarding these queries. Learning curve: it’s applied from first aircraft. Since we don’t have the input of how exactly did the first unit cost, I derived the cost of that first unit from the average cost of those first ~50 units which are in WIP. Learning curve formulae allow you to get then the value of the first unit from which to commence the series and apply the learning (every doubling of production units costs are reduced an x %). First of all, I commend you on your excellent analysis and explanation. I really learned something new by reading this post on your blog. Thank You! I know that this analysis is almost a year old now, and that you have moved on to other things, but I have a few comments/questions that I would like to add to the discussion. As you have demonstrated in your analysis, the question of 787 break-even really comes down to the learning curve, how quickly will Boeing improve and streamline production to force the unit cost down. In your overall conclusion you went with the 84% learning curve because that is what the 777 program achieved historically. Boeing’s target is 75%. Why did you choose the worst case scenario? It seems you should have split the difference and based your overall conclusion on the 80% curve, or you should have stated explicitly that your conclusion is for the worst case scenario. I realize that the 84% learning curve is based on real performance data for a well run 777 program, but it might have limited application to the 787 program. At the time that the 777 was undergoing its initial production ramp-up, Boeing had decades and decades of experience producing metal airframes. How much could Boeing expect to improve their production process since presumably all of their previous production experience was factored into the initial 777 production plan. The 787 represents a totally new way of constructing aircraft, at least for large airliners. It seems very likely that Boeing could still have much, much more to learn about streamlining the production process. Perhaps a 75% learning curve is not overly optimistic after all, given that the production of large scale composite aerospace structures is relatively new compared to all metal structures. Also, as you stated in your post, the first 40 or so, 787’s required extensive rework and change incorporation, and as it turned out, the next 25 required various levels of change incorporation. Line number 66 was the first 787 to not require any additional change work and should cost substantially less than the previous units. Since your initial unit cost estimate was based on units that all need substantial additional work, the cost reduction represented by LN66 and all the units thereafter should show up as a substantially better learning curve than for a program where large changes were not required. Again, I appreciate your thorough analysis and well written explanation. I just think there are legitimate reasons to believe Boeing can achieve a learning curve closer to 75% and therefore a break-even point closer to 10 years instead of the more than 30 years you state in your conclusion. thanks for your long and seasoned response. As you said I simply took the figure of 84% as base case being the one of the latest Boeing program. I don’t think that it is a worst-case scenario, though. It could also be possible that such curve is not achieved. This, I don’t know at this moment. It may well be the case that as you say Boeing has a much wider room for improvement with 787 new manufacturing technologies and is able to achieve a learning curve of 75%. I think it is a good point of yours. In that case, it may be able to break-even by around 2021. I also included that case among the graphics shown. As you saw, the learning curve is a big factor in the whole case, but other one are delays (which involve deffered cash in-flows due to late deliveries, penalties, and increased R&D). The 3-year delay is jeopardizing the case (for 10% discount factor and 80% curve) by delaying the break-even about 15 years! Of course, the discount factor can also change the picture a lot, but that is more a game for financial engineers :-). I am teaching pharma R&D people about business and I would like to use some of your charts in my teaching sessions. In order to adapt them to the pharma model, would it be possible to get your underlying excel spreadheet(s). When do you think Airbus is going to declare the date of assembly line shotdown for the doomed A380 Project ?